Well a lot. You’ll have to get used to new user interface, which works a little different from our previous products. But we think, the changes are for better. In my experience, you’ll get used to it in a few minutes. The main change you’ll notice is the new way of creating laser show scenes. Now you can use complete timeline in every scene of banks. Generally, all the scenes of banks are a little (or big?) shows. But don’t be afraid of complexity – the speed of creation is not very different from previous Fiesta or Moncha interface. The most important feature you’ll use when creating new scenes is the animation stacking. You can stack multiple animations below every event, which generates image/graphics. And this allows you to create complicated laser show movements. If you remember the tree interface from Fiesta, it’s still present. But it’s not so “mathematical” anymore (I’m mathematician by my origin, sorry for that :) ). We’ve been inspired here by Premiere (or any other video editor). You can now create groups and within groups you can create complete scenes. And once you have the group in the timeline, you can stack more animations below to change the animation of whole group. Simple, but very powerful. What’s also amazing, you can control the phase/time of the group within the timeline. This allows you to accelerate/deaccelerate your scenes (or just part of them). Maybe you don’t know our LED Strip Studio brand. It’s a complete system to control digital LED pixels or LED strips. And it’s using very powerful coloring effects. We’ve used and improved these (originally LED) coloring features in new Fiesta for Mac as well. 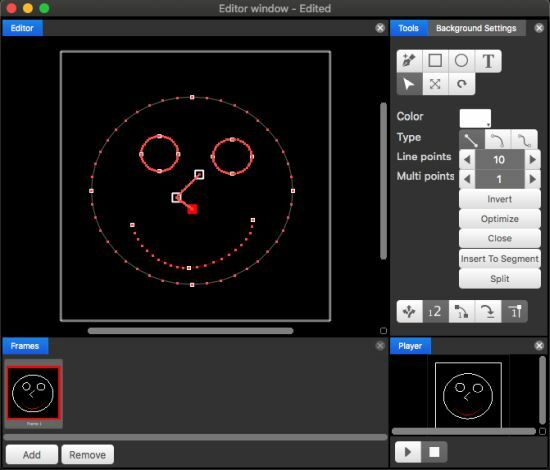 Now you can finally color your laser-mapping frames using 2D circle or rectangle shapes. But it’s great even if you use it just for any beam shape (especially great for circle or triangle). As I told you in the beginning, we’d like to use 5 or more lasers for our shows. 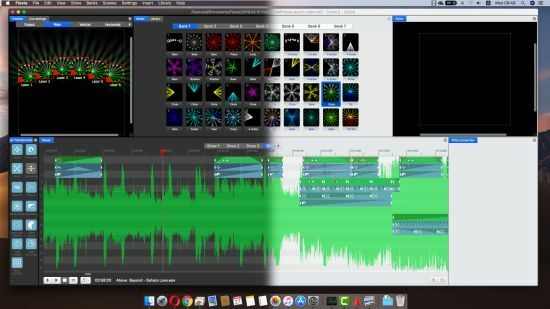 That’s why there are lot of nice tools available in new Fiesta for Mac for you to create amazing multi-laser effects. My most favorite is the time offset event. 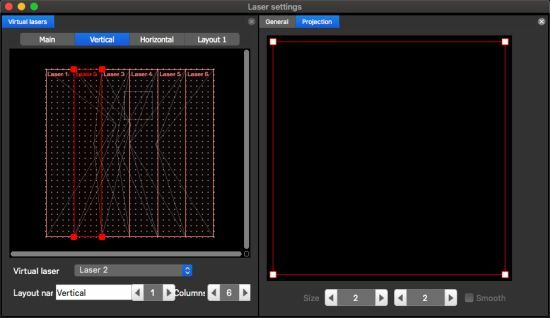 It’s working so simple I could not even talk about it :) … You just drop the time offset animation before your other animations and all the remaining animations are slightly (or much) moved in time for every laser. Great especially for rotating animations. This is probably a topic for separate article. 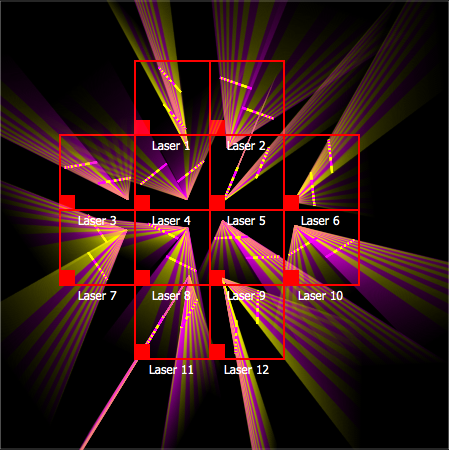 This tool allows you to split your laser graphics or beam effects into multiple lasers anyway you want. 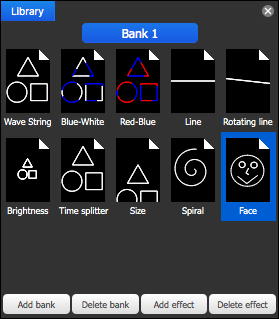 You can define your own layout – which means position, size and even screen mapping of every laser drawing area separately. 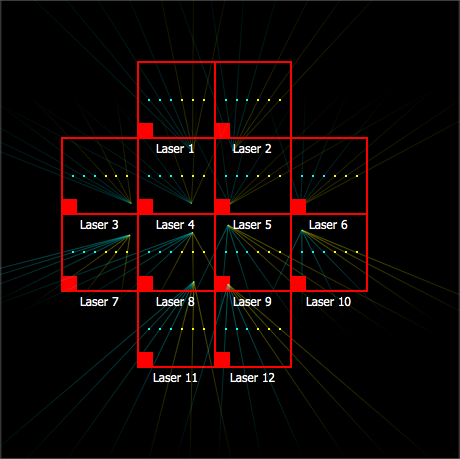 What’s nice, you can have one hardware laser included in multiple layouts. 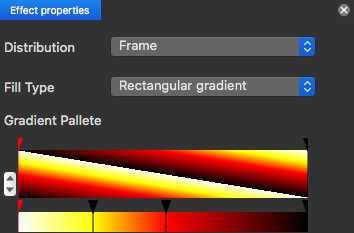 This is great, because you can split your graphics vertically, horizontally or any other crazy way using the same laser(s). And what’s even better – you can set, which layout will be used in timeline (layout splitter is generally animation in timeline). If I have to choose the one tool, which is the most important in the new Fiesta, I would definitely choose animation library. “But it’s just a library” I can already hear you saying. No, it’s a creation tool on steroids. 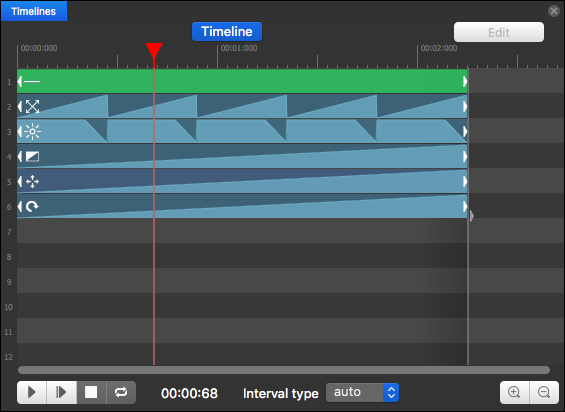 Animation library can store graphics, animations, … basically everything you use in timeline. You can now store not just amazing color effects, rotations or any other animations in the library. You can store the complete scenes there (no matter if it’s your laser graphics, basic shape or complete animation with graphics). And you can use it in scenes or shows as well. I know it sounds like a logical way of how it should work in every software. Well, now it does. I still think, Quazar 2 is the best draw editor for laser graphics (anyway, I might be biased here, since it’s my first laser show baby :) ). Well, was. 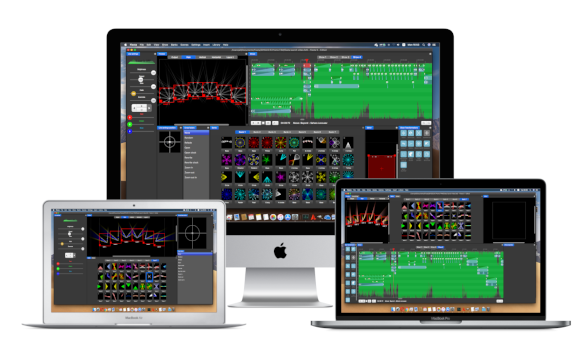 Thanks to direct integration of the editor inside laser show software, your laser mapping will be done in seconds. And you can still use the tools from Quazar – Bezier curves (yes, the basic tool in CorelDRAW, Illustrator or any other graphics software) and you can now create animations as well. Just all you need for laser graphics. The question you might ask, why it took us so long to develop the new software. Well, we’ve had some other fights to finish and we’ve redesigned quite a lot since we’ve started the development of Fiesta for Mac. But some features just require time to test and improve. And I think all the features you’ll find in new Fiesta are the core of what you need to create amazing laser shows. So, go ahead – download the demo, try it and if you like it – we have a really nice new hardware you can use it with ;) … till next time. © Showtacle Ltd. All rights reserved.